The establishment of the wine producing venture was also made possible by the Land Affairs and Fairview support, as a vehicle to raise funds to eventually build the beneficiaries’ homes on the land. 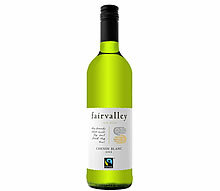 In 1998 the first Fairvalley wine was launched - the Chenin Blanc - which was quickly sold out to a large UK wine importer and set the track for the future. It started as an socio-economic empowerment venture, where the idea was to rely on available skills amongst the workers - the members of the Fair Valley Association all have long years of experience in grapes, wine production, packaging etc, and it was only natural for them and for Charles Back, the owner of Fairview, to utilize their expertise and make a successful business out of it. The profits from the business are aimed to help the Association to develop the FairValley land. The logo, with the two hands, and the slogan - "THE HANDS THAT WORK THE SOIL FEED THE SOUL" say it all. At the same time, due to the association with FAIRVIEW, there is no compromise on quality and diligent production procedures. 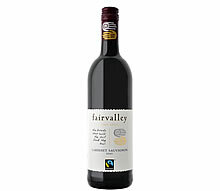 The FAIRVALLEY wines are being made under the same strict standards as the FAIRVIEW wines. 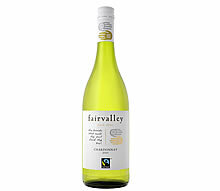 Today, the FAIRVALLEY range includes the Chenin Blanc, Chardonnay, a White Blend (comprised of Chenin Blanc & Sauvignon Blanc), Cabernet Sauvignon and the Pinotage. Most of the production is being exported to - USA - Banks Channel LLC; Japan - Mottox; UK - Enotria Winecellars; Finland-Fondberg; BIG5 Wine - Germany. Some of the wines are being sold to the local consumers at the FAIRVIEW tasting room. 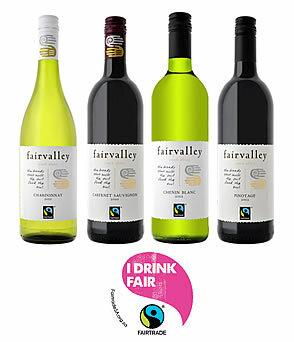 All FAIRVALLEY wines are produced with grapes grown on FAIRTRADE CIRTIFIED vineyards located in Citrusdal area. A well rounded wine with hints of pineapple, ripe melon and peach flavours on the nose. The palate is fruity with prominent creamy vanilla notes and fresh citrus flavours, medium vanilla on the aftertaste. Enjoy with poultry or Asian cuisine. 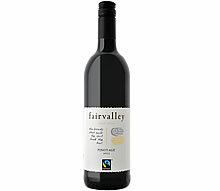 A medium bodied wine with aromas of ripe blackcurrant, plums and hints of dark mint chocolate. Well balanced with gentle oak texture. The wine will pair well with rich casseroles and roasts. wine with fruity aromas of melon and pear on the nose. Well-rounded palate with lively stone fruit flavours and refreshing acidity on the finish. Enjoy with Light seafood, pastas or spicy Asian cuisine. Bright red colour in the glass, with vanilla and cherry aromas on the nose. The palate is medium bodied with blackberries, wild raspberries, coffee flavours and well balance oak finish.